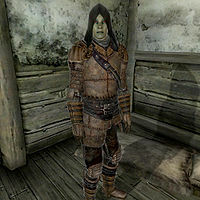 The Morag Tong Assassin is a Dunmer added by the Mehrunes' Razor official plug-in. You will originally find him in the Jail in Sundercliff Village, where he has been imprisoned by the Drothmeri. They know that he must have been sent to assassinate someone, but have been unable to discover the target. You can choose whether to ignore him, release him, or kill him. If you kill him, you will find that he is wearing a unique set of Morag Tong armor, plus a possibly enchanted dagger and a piece of stealth-related jewelry. The armor is particularly valuable, consisting of leveled Morag Tong Boots, Cowl, Cuirass, Gloves, and Greaves. These are some of the best light armor pieces for stealth-related characters available in the game. However, the level you receive is randomly determined: even level 40 characters only have a 50% chance of receiving the best quality items (and a 50% chance of receiving the second-best items). The level is even calculated differently than other items: it is calculated at each level-up, not when you first enter the zone. His orders, revealed by a Soiled Writ of Assassination, are in fact to kill the Drothmeri Commander (whose full name is revealed to be Commander Telani Adrethi). If you choose to release him from jail, he will immediately slip into sneak mode (with the help of some strong Chameleon potions) and head off to find the Commander. He generally succeeds in assassinating the Commander, so freeing him can be useful. After completing his assignment, he will make his way to the Inn of Ill Omen. He no longer serves any purpose (other than the valuable armor that you may covet), but he will attack any NPC that he sees. [verification needed — relationship needs investigation and testing] Note that he has infamy points so killing him will not count as a murder.